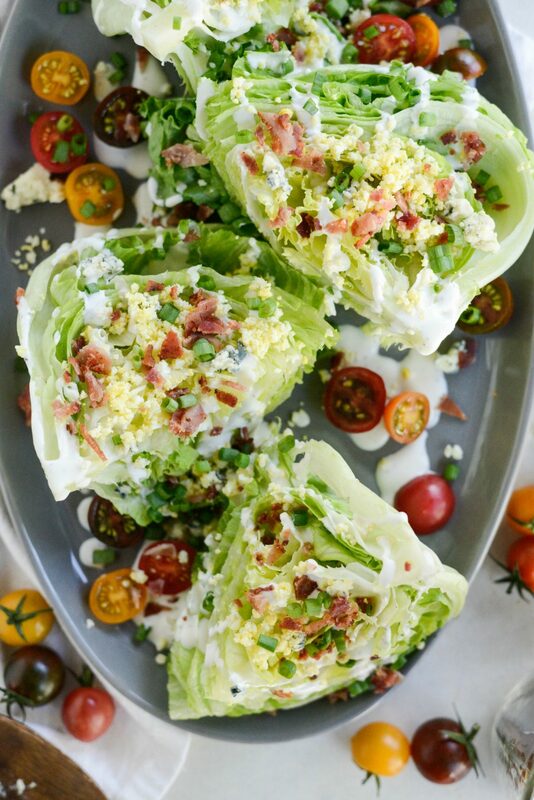 This Loaded Wedge Salad is drizzled with a black pepper buttermilk dressing and topped with bacon, blue cheese, hardboiled egg, tomatoes and green onions. 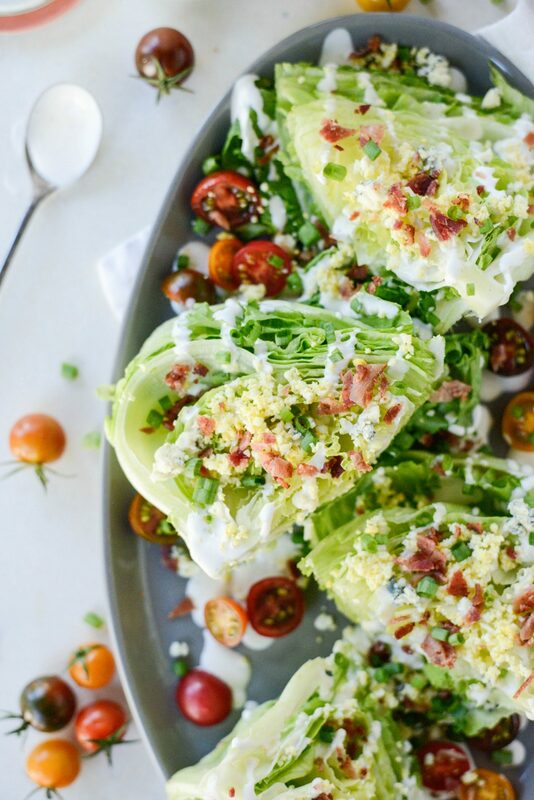 A fun twist on a classic wedge salad. But at home, I don’t make wedge salads nearly as often. Why is that? 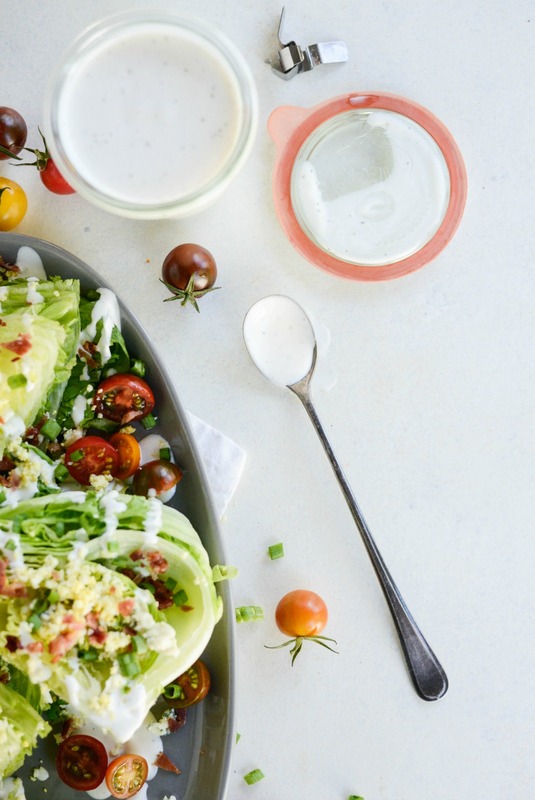 Well, I’m about to change that right now and it all begins with this loaded wedge salad with black pepper buttermilk dressing. First of all this dressing. It’s like ranch dressing just minus the herbs and doubling-up on the black pepper. 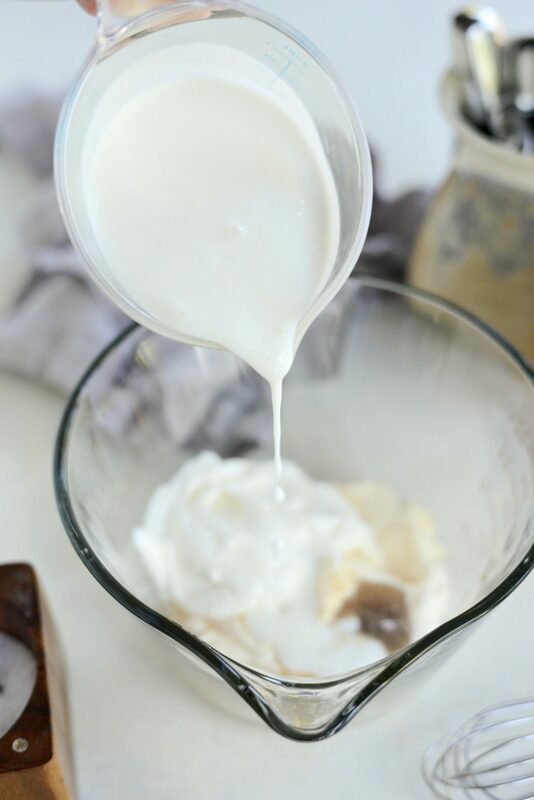 It’s creamy and light and delicious. A nod to my husband who puts a heathy (read: ridiculous) amount of black pepper on everything. 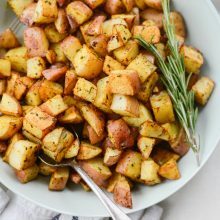 With him in mind, I decided to ditch the herbs from my traditional buttermilk ranch recipe and swap in an obnoxious amount of black pepper. Then thinned it out with a touch more buttermilk than called for because we love a creamy salad dressing that wavers on the side of being runny. 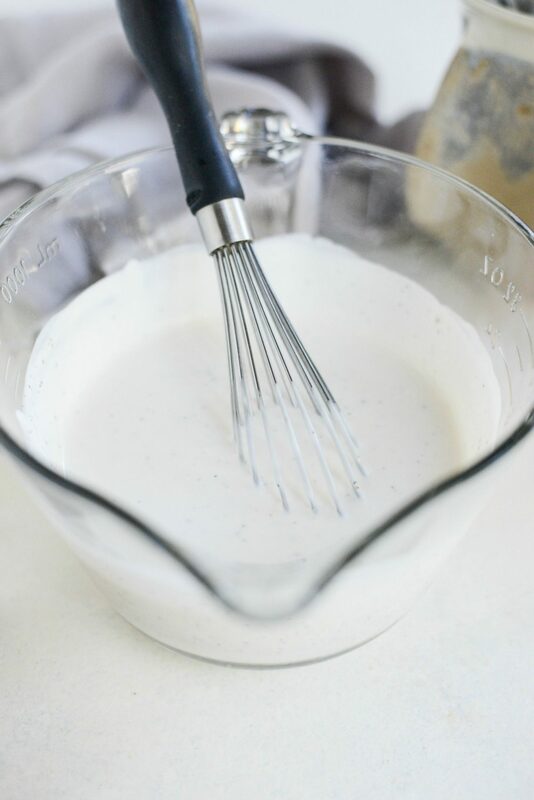 And this buttermilk dressing definitely fits the bill. First thing, prep! 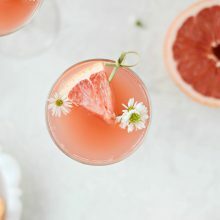 The prep is minimal here <—-my kind of recipe! I was cooking up bacon to have with our breakfast so I snuck 3 pieces and kept them off to the side for this salad. I had a couple of hardboiled eggs leftover too from a salad I made earlier in the week, so I just peeled them and tossed them into my mini food processor and pulsed them until they were small crumbles. Although a knife works just as well. I love a crumbled hardboiled egg. Back when I worked at the hospital, my favorite part of the salad bar was their crumbly hardboiled egg. SO good. Moving on. 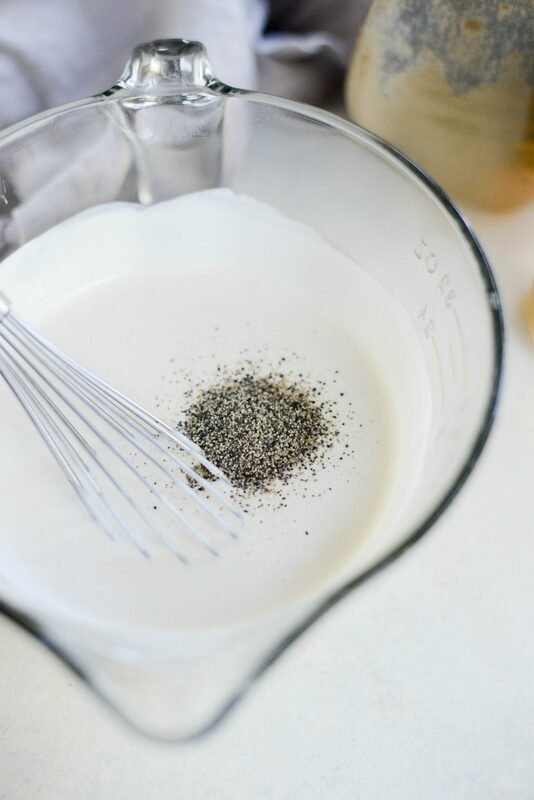 Next, let’s make the black pepper buttermilk dressing. 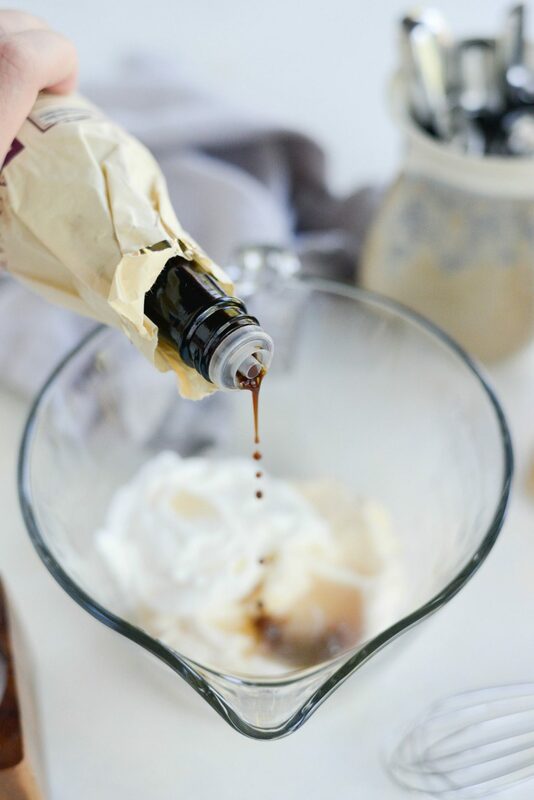 Start by measuring and adding a 1/2 cup mayonnaise, 1/4 cup of sour cream and then a 1/2 teaspoon kosher salt into a mixing bowl. 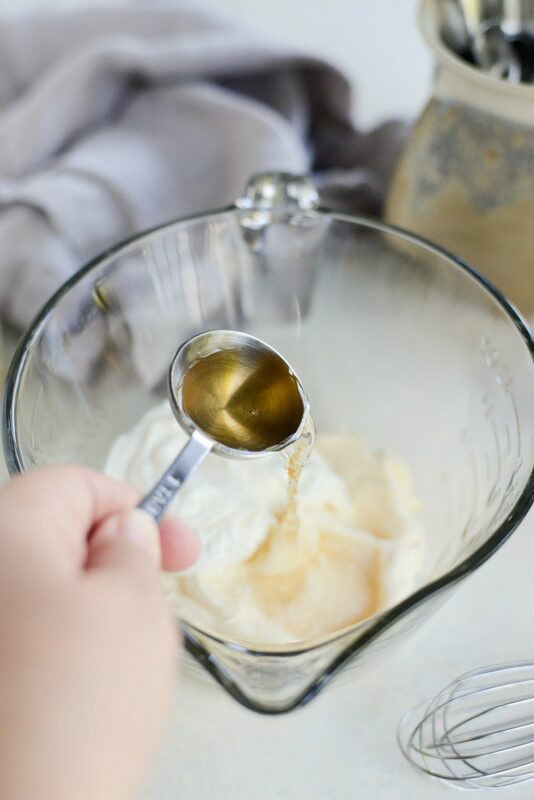 Next add in the tablespoon of champagne vinegar, a few splashes of Worcestershire (here’s my homemade version incase you’re interested) and then pour in a 1/2 cup of buttermilk. Finally add in 3/4 teaspoon of coarsely ground black pepper and whisk to combine. Next, cover tightly and refrigerate until ready to serve. 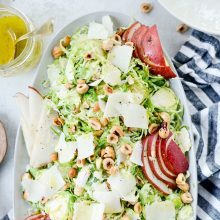 With this salad, any tomatoes will do! 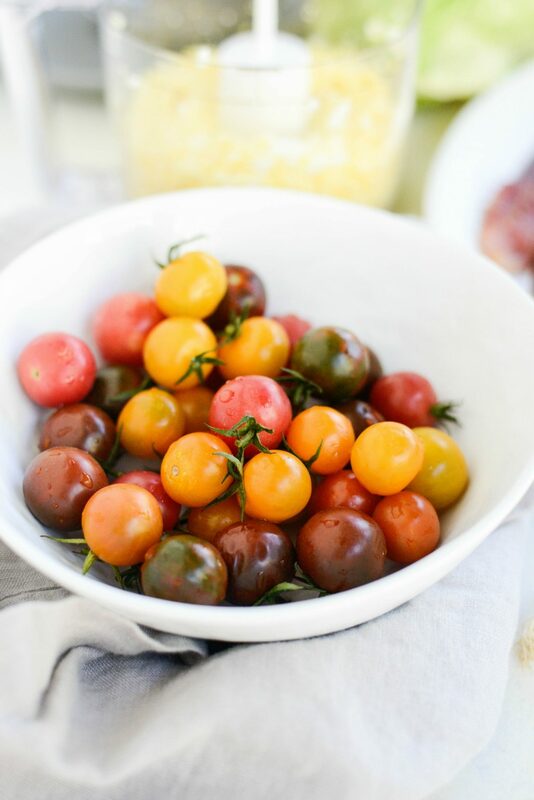 I’ve used chopped and seeded Roma tomatoes and cherry tomatoes before but if you can find some of these baby heirloom tomatoes, USE them! They’re delicious! Next blue cheese. 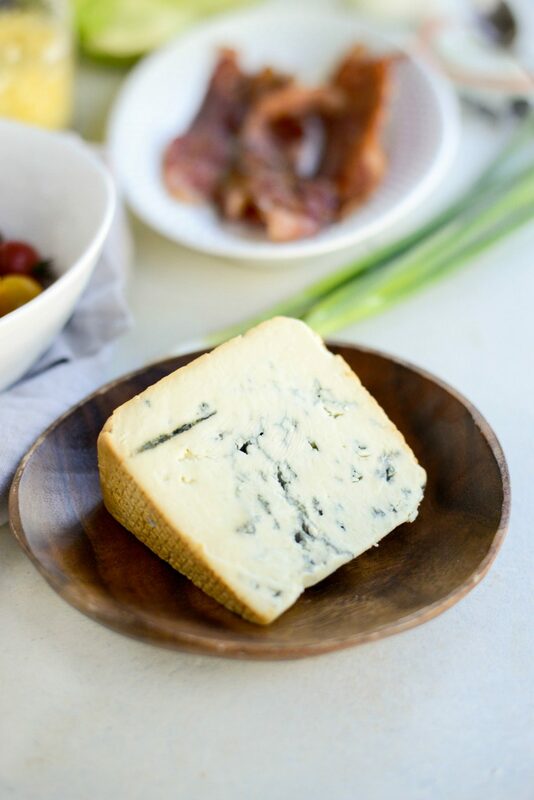 I looove blue cheese. Like a lot. That’s most likely my favorite of all the cheeses. 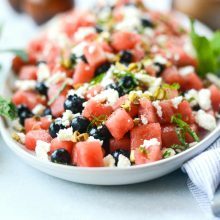 For this salad, I’m using a smoked blue cheese, but you can use whatever blue cheese you like. Or sharp cheddar even. Next, cut the iceberg into equal sized wedges. If making this loaded wedge salad in advance, I highly recommend using a plastic serrated knife. Doing this will keep your lettuce from turning that rusty brown color. 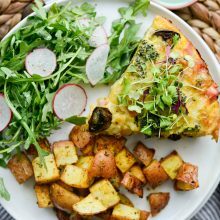 Next, arrange onto a platter and drizzle with as much of the black pepper buttermilk dressing as your heart desires. Because why the heck not? 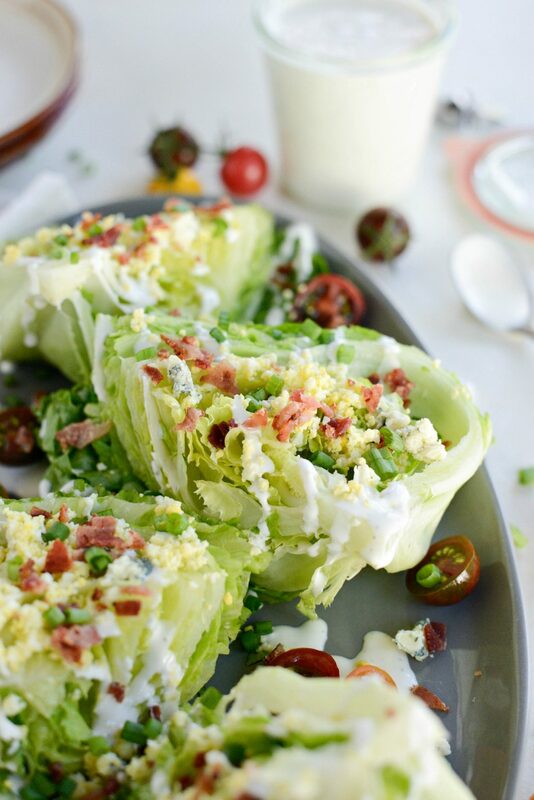 Then top with tomato halves, crumbled hardboiled egg, blue cheese, bacon and sliced green onions and then if you’re like my husband, even more black pepper. Now serve with chicken, steak or pizza. This is a fork and knife salad so be sure to serve with utensils. Enjoy! 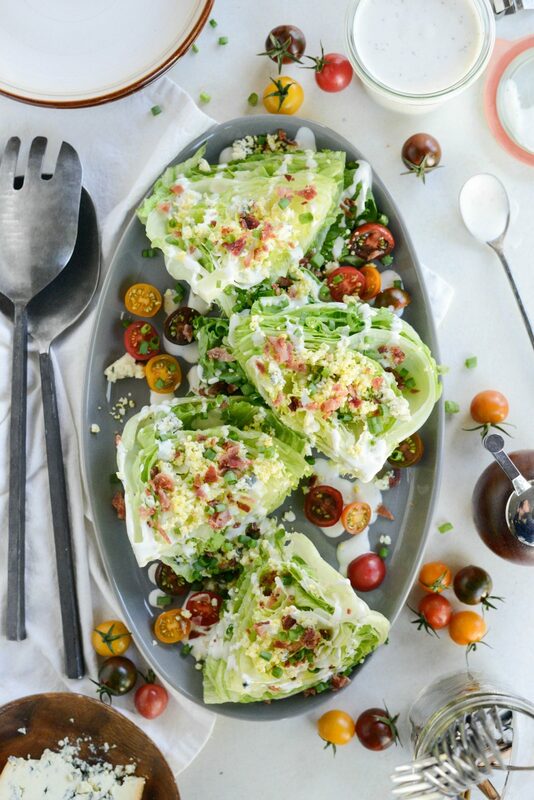 And if you give this Loaded Wedge Salad recipe a try, let me know! Snap a photo and tag me on twitter or instagram! 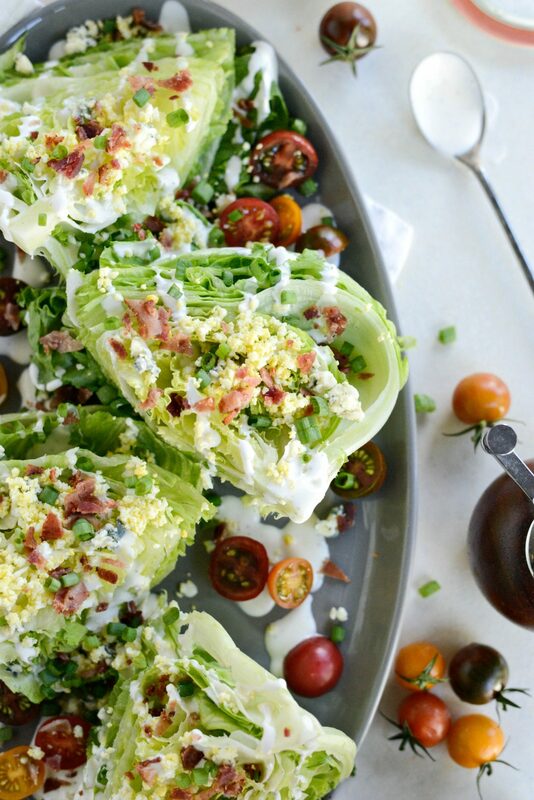 This loaded wedge salad is drizzled with a simple black pepper buttermilk dressing and topped with hardboiled egg, blue cheese, bacon and green onions. 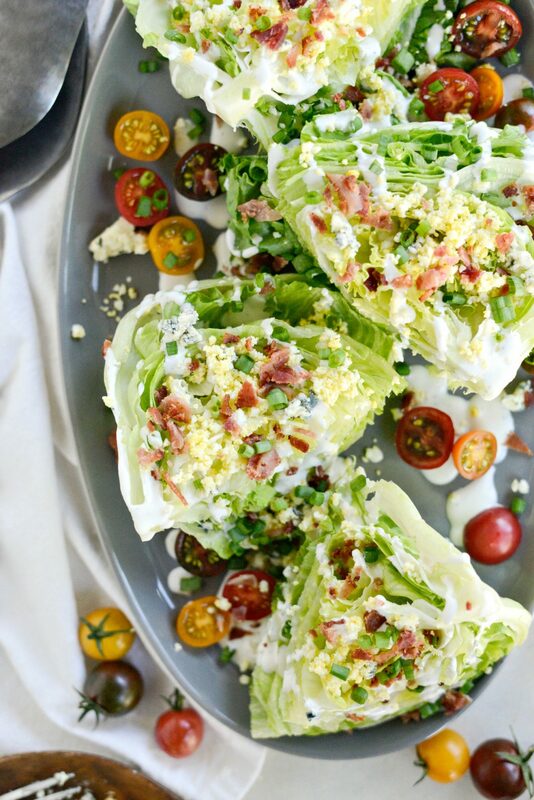 A fun twist on a classic wedge salad. 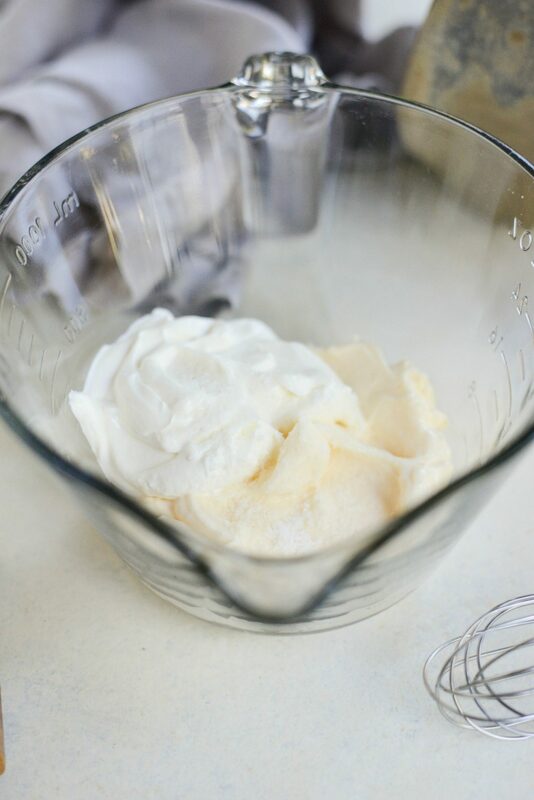 FOR THE DRESSING: In a mixing bowl whisk together the mayonnaise, sour cream, buttermilk, vinegar, Worcestershire, salt and pepper. 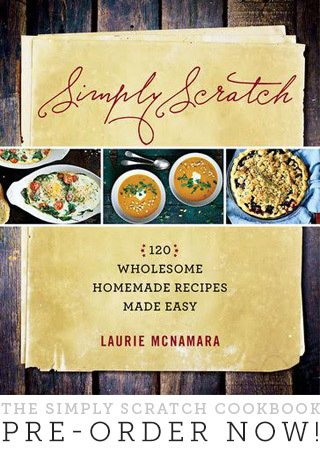 Store in an airtight container in the fridge until ready to serve. FOR THE SALAD: Cook the bacon until crispy and chop into small pieces. 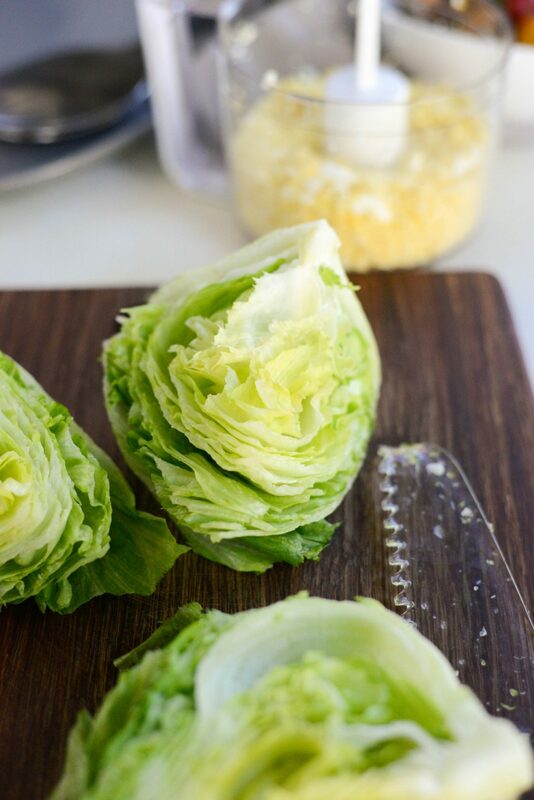 Cut the head of lettuce into fourths and arrange on a platter. 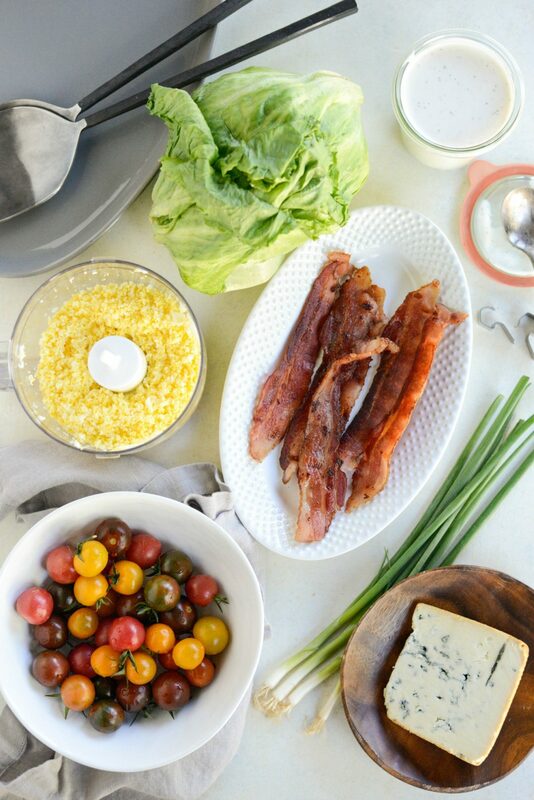 Drizzle with dressing and top with tomatoes, hardboiled eggs, cooked bacon, crumbled blue cheese and green onions. 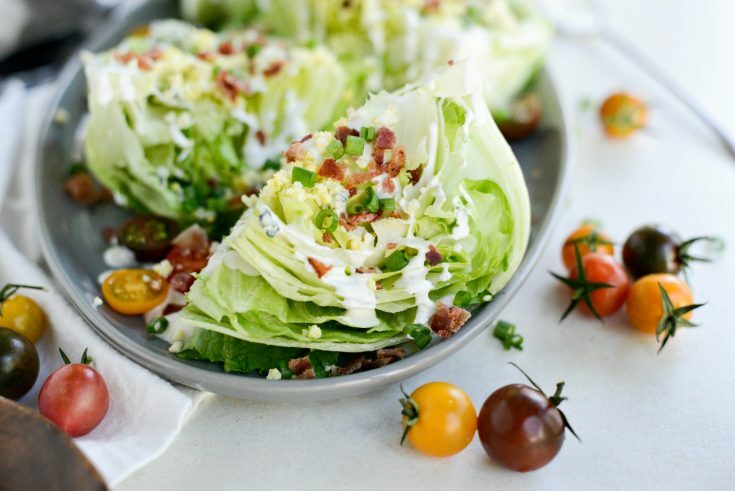 Pro Tip: If making this loaded wedge salad in advance, use a plastic serrated knife and the edges of the lettuce won't turn that rusty brown color. 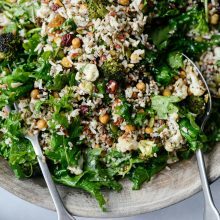 I made this salad tonight and it was great! Thanks for the recipe.